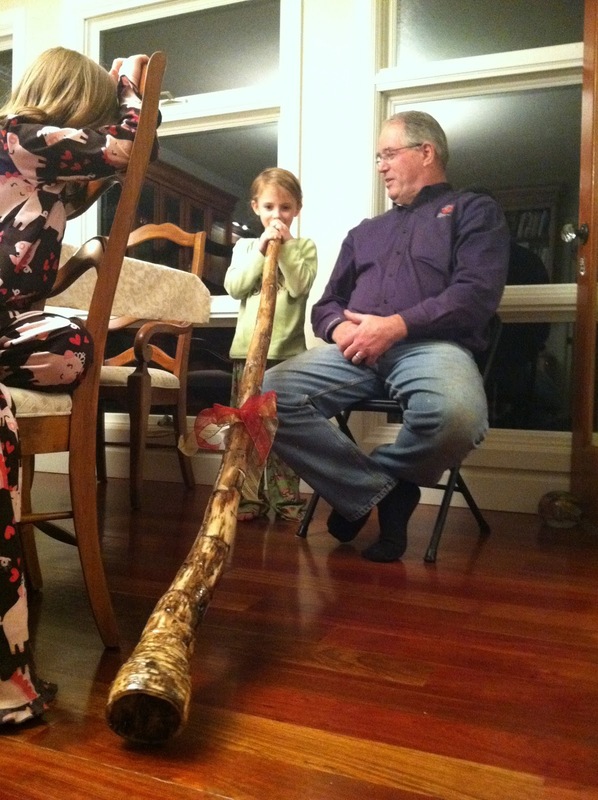 Who knew Callista would have a natural flare for the Didgeridoo? Grandpa received this gem from a work colleague for Christmas. 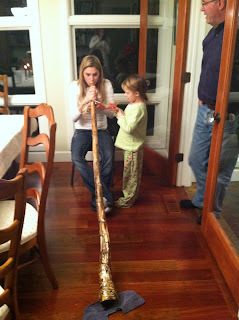 We had a "blast" New Year's Eve trying our lungs on this creation from down under. It was a rare moment in the spotlight for Callista, who happened to be significantly better than Ellery. When does that ever happen as the second child? We were cheering her on with fervor. No holiday season would be complete without "snowballs." We used rice milk ice cream this year, and they were as yummy as ever. Emmett was too afraid to eat his ice cream while the candle was lit, so he opted to be first out. It was so fun to spend time with Brock and Amy, Daegy and Pierce. We had some intense games of Settlers of Catan, during which my father became very offended at Brent's bargaining techniques. It was just too much for him when we made a deal with Brock and Amy to keep the robber off their land for the remainder of the game. BTW: Dad and Mom won. We started this year about as low as we have ever been as a family. We were dealing with a new, official diagnosis of PCD and bronchiectasis. Ellery was completely non-functional with ear pain and emotional anxiety issues from all the doctors appointments and new regimes. Callista was feeling abandoned and neglected. Emmett was a gooey mess, but sweet nonetheless. Berkeley's ears were a mess, but thankfully she remained out of the hospital through the winter. Brent's busiest time of year, happens to be January, and with Ellery and I only sleeping a few hours each night, and crying the majority of a 24 hour period, I wasn't certain I would make it. There were small miracles. One that stands out is when Christy came back to my door after leaving, Brent was out of town, and said, "What am I doing leaving you here alone. What can I do to help?" Another was when Jill showed up at my door at 5:50 am so I could go run. The countless hours my running friends spent listening to me cry and hash through my frustrations and fears as we ran. In February we jumped ship for Hawaii, to try and pick the family up. We were sick the entire trip but it seemed to turn the corner for us. Ellery started walking again, as her stomach pain subsided. I got control of myself. Brent and I reconnected. Emmett was in heaven in his bathing suit for 11 days. Unfortunately, at the same time Papa turned the corner. He was hospitalized and never came home, finally passing away in March after some excruciating final months. It was extremely difficult for Mimi, and all of the children who flew back and forth to California again and again to help during these months. Spring and Summer were busy as the children began to excel in gymnastics. My running intensity picked back up again. Thankfully life was very uneventful. The end of Summer brought a few illnesses but nothing we couldn't handle. Homeschooling with 4 children is both exhilarating and exhausting. It is a constant battle for me to temper my intensity, which my daughters all seem to have inherited. Callista being the most like me. Maybe because we both fell second girl, second child. Math whizzes, love reading...but love our independence too. I believe the children are thriving but not without a mental and emotional cost on my part. There are lots of rewards but each day is filled with challenges as well. The year closes and we are in such a peaceful place. Not everything has certainty. Of course we wish there were more snow. But each little speed bump we seem to be handling. The course has been moving us forward. 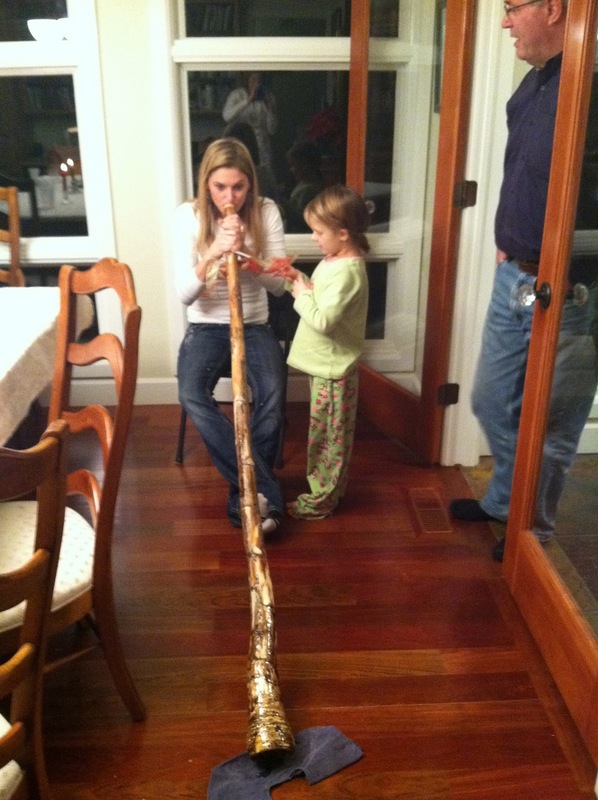 Didgeridoo in the New Year! Let it begin. Wow, I'm glad the year ended so much better than when it began! Hopefully this January's going smoothly... I'm excited for you and the new house prospect! Good luck with everything!